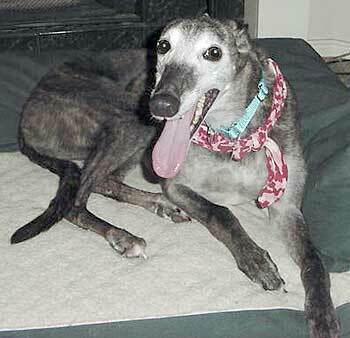 Halle is a very striking 7-year-old dark-brindle female, born February 1998. Halle's registration number is not readable, so we don't know her history at this time. 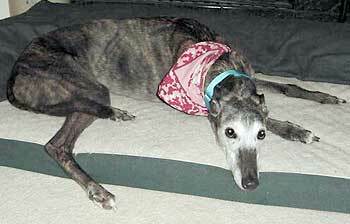 Halle is an owner surrender to GALT from a lady who adopted her in December 2004 from a shelter in Colorado. Circumstances now do not allow her to keep Halle, so she is in GALT's care. Halle's appearance is very unusual in that her face is so much lighter than the rest of her coloring, and she even has a ridge on the back of her head down to her collar line! It is not known at this time if Halle is small animal or cat tolerant. Halle is a beautiful 7-year-old dark brindle girl with a uniquely marked face. She looks as if her face was dipped in white, and a dark patch painted down her snout. Quite striking! Halle is a very well-behaved girl in the house, which makes her one of our easiest fosters yet. She crates nicely, but we're not sure it's necessary. She only chews on Nylabones, and never picks up anything she shouldn't. You'll never hear a peep out of this sweet, shy girl - she prefers to keep to herself and lay on a dog bed. She sleeps quietly all night on a dog bed next to her foster parents. She walks very well on a leash, and will ignore any small critters if you ask her to. It is still not known, though, if she is small animal/cat tolerant. Due to her shyness, she may not be suitable in a home with small children - she is so shy that you have to let her come to you for attention. She very much loves human interaction, but prefers it to be when she is up for it. She is sensitive to the touch, and does not tolerate being "messed with" as she seems to think she's going to be hurt even when all you are trying to do is to touch her ears or gently move her. She is great about having her toenails trimmed, but again, you have to handle her very carefully. Even though she is shy, there is absolutely no sign of aggression. She just cries out as if you've hurt her. More than likely, time will give Halle the confidence she is currently lacking. Being an owner release, we are not sure what her life was like before. We hope that the certain special someone will take one look at Halle's face, and just know that she is the one. Patience goes a long way with a shy girl like Halle. But she will make it worthwhile with her sweet gentle nature. All in all, Halle will be a wonderful companion to the people lucky enough to adopt her. All she asks for is a comfy dog bed and loving home!